Carey Price was born August 16, 1987 and grew up in Anahim Lake, a remote village in British Columbia with his sister, Kayla, and parents, Lynda and Jerry. At the age of 2 Carey learned to skate on the river next to his home and spent countless hours over the next few years playing outdoors with his dad and friends. Although he spent lots of time on the ice, there was no indoor arena or hockey program in Anahim Lake. He began playing organized hockey at the age of 9 at the nearest arena located in Williams Lake, BC. The commute to Williams Lake for games and practices required a 640 km round trip three time per week. Fortunately, Carey’s dad had a pilot’s license and they were able to fly back and forth when the weather was good, but most of the time they had to drive. Being the son of Jerry, whose family are farmers and ranchers in Alberta and Lynda whose family were ranchers and hunting guide-outfitters at Anahim Lake, Carey has always had a natural love for animals and the outdoors. There is no more relaxing place for him than the quiet forests and mountains of BC with his 2 Labrador retrievers Motty and Duke. Carey is also very proud of his Nuxalk and Southern Carrier Aboriginal heritage. His descent is from a line of Chiefs and leaders which include his mother, Lynda, who was the first woman elected to the board of directors for the Union of BC Indian Chiefs. On August 24, 2013 Carey married to Angela Webber in Kennewick, Washington. They met while Carey played junior hockey with the Tri-City Americans. Angela has been a wonderful companion to Carey and is involved with several charities in Montreal and elsewhere. Upon receiving the Jean Béliveau Trophy awarded annually to a Canadiens player for his involvement with charities and in the community, Carey told the media, “I think my wife deserves her name on the trophy more than I do, she’s really the catalyst behind a lot of the work”. The morning after their wedding, Carey left at 4 am to catch a flight to Calgary with Canadiens teammate PK Subban for Hockey Canada’s 2014 Sochi Winter Olympics orientation camp. While playing minor hockey on the Williams Lake Bantam AAA team, Carey was picked in the first round, 7th overall in the 2002 Western Hockey League bantam draft by the Tri-City Americans. The next season at the age of 15 Carey played half a season with the Junior “A” Quesnel Millionaires of the British Columbia Hockey League and finished the year with the Williams Lake Midget AAA team. The midget team went on to win Williams Lakes’ first and only AAA Provincial championship at any level. Carey also made his first WHL appearance that season in a single game for the Tri-City Americans against the Brandon Wheat Kings. Carey was too young to stay with the Americans that season but played the next 4 full seasons in Tri-City. 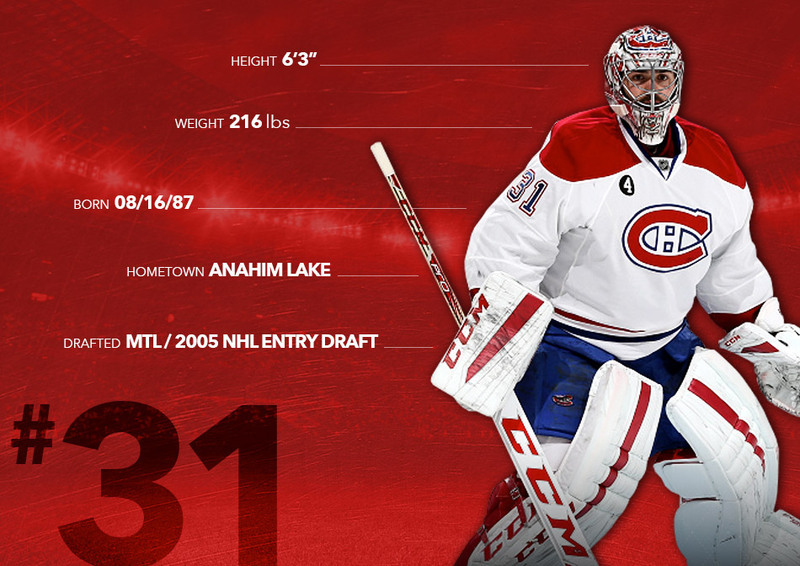 At the 2005 NHL amateur draft in Ottawa, Carey was selected in the first round, 5th overall by the Montreal Canadiens. It was a surprise to some but a huge thrill for Carey. When told that many considered playing goal for the Canadiens a tougher job than being Canada’s Prime Minister; Carey’s response was, “Hmm, maybe next year I should run”! After Tri-City was eliminated from the 2007 playoffs Carey signed an entry level contract with the Montreal Canadiens. He joined their American Hockey League affiliate Hamilton Bulldogs just before the start of the 2007 Calder Cup playoffs. In two regular season appearances with the Bulldogs, he allowed only three goals and won one game. Carey led the Bulldogs on a remarkable run that spring, defeating the Hershey Bears 4 games to 1 in the finals as the team won their first Calder Cup. Carey became youngest player to win the Jack A. Butterfield Trophy as the playoff MVP, posting a 2.06 GAA and .936 save percentage. He also became only goaltender in hockey history to be named CHL Goaltender of the year, World Junior Championship’s tournament MVP and win the Jack A. Butterfield Trophy, all in the same year. Carey made his first start for the Canadiens on October 10, 2007 against the Pittsburgh Penguins and recorded 26 saves in a 3–2 win. Although reassigned to the Hamilton Bulldogs in January, he was recalled just over a month later. Upon his return, goaltending partner Cristobal Huet was traded to the Washington Capitals leaving Carey with the starting role. The Canadiens finished first overall in the Eastern Conference and earned their first division title since 1991–92. Carey completed the regular season leading all rookie goaltenders in wins (24), save percentage (.920) and shutouts (3). He was named to the NHL All-Rookie Team in recognition for his accomplishments in his first year in the NHL. Carey has been blessed to play the game he loves in a great city for the most passionate fans of any team in any sport. His name is written in Canadiens record book in several goaltending categories. The most important one is winning 44 games in the 2014 – 2015 season. His 44 wins eclipsed the old mark of 42 set by goaltending legends Jacques Plante and Ken Dryden. Carey’s ultimate goal, of course, is to win the Stanley Cup for the fans of the Montreal Canadiens. At the age of 16 Carey made his international debut with Team Pacific, one of 5 Canadian regional teams at the 2004 World Under-17 Hockey Challenge in St John’s Newfoundland. Carey has gone on to proudly represent Canada 5 times.